In modernizing the University of California, Davis campus, Landmark Construction replaced building heating and cooling systems. As a result, campus facilties are more comfortable for students, faculty and staff. The new energy efficient systems also reduce ongoing expenses for the public university. The new heating, ventilation and air conditioning (HVAC) units had to be placed on the top of occupied buildings and the older models had to be removed. This required bringing cranes onto the campus filled with students. In fall of 2015, there were over 36,000 students enrolled at UC Davis. Additionally, boilers, chillers and air handlers were transported into building basements. And, the older models had to be removed. Landmark Construction managed the timing of moving this large equipment when the campus would be the least impacted. With safety in mind, Landmark Construction worked with campus facilities managers to time the operation when the campus would have the lowest number of people on site. Coordination with campus police and transportation services was required to bring the crane onto campus and get it close to the buildings that were being remodeled. The perimeter where the crane was being operated was secured and occupants were directed to use alternative doors for ingress and egress. 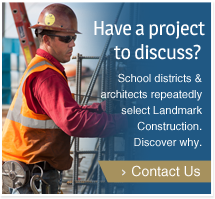 Landmark Construction has an outstanding safety record and selects subcontractors with equally stringent safety policies. The company works with a safety consultant to conduct impartial job safety analysis as well as regular internal audits to identify opportunities to enhance safety programs and employee training. The Loomis-based contractor has developed a Culture of Safety that involves every employee. Staff awareness and training make it possible for Landmark Construction to meet the requirements of the California Occupational Safety and Health Administration (Cal/OSHA) Safety and Health Achievement Recognition Program (Cal/SHARP). The new equipment successfully replaced the older inefficient models and the campus currently enjoys more comfortable classrooms, laboratories and office space as well as lower utility bills. Incorporating energy efficiency into new construction is a priority for this university that has become a national leader in the field. The Energy Efficiency Center at UC Davis was the first university-based energy efficiency center in the United States to focus on the transfer of technology into the marketplace. UC Davis has also won numerous awards for energy efficiency and green practices. In the August 11, 2015 “Cool Schools” report in Sierra magazine, University of California, Davis was ranked number two in the nation. According the article, Sierra magazine: UC Davis is green and cool, again, UC Davis was ranked number one for sustainability efforts among US colleges and universities in 2012 and “earned a ‘green’ score of 98 (out of 99) in the new edition of The Best 380 Colleges, published annually by The Princeton Review.